Dubai, UAE, December 18, 2018: Located at one of the world’s busiest airports, Dubai International Hotel is renowned for its service excellence and personalised hospitality to transit passengers and travellers alike. At the recent iteration of the Middle East Hospitality Excellence Awards, the 5-Star Airport Hotel won Gold and Silver recognition for its F&B services, Timeless Spa and Purchasing. Adding to its winning streak in 2018, Dubai International Hotel’s team has yet another reason to celebrate during the festive season. This Airport Hotel is home to nine outstanding restaurants, ranked within the top 10 on Trip Advisor, serving a delicious fare ranging from cuisines ranging from Continental, Indian, Asian, Arabic to authentic Spanish food. With the hotel’s F&B offerings presenting innovative delicacies with silver service par excellence, Mr Sunil Nair won Gold for “F&B Service of the Year” while Mr Galagedarage Piyasena won silver for “Purchasing of the Year”. With over 1000 candidates competing to take home the nomination of being one of the best in their category, the Middle East Hozpitality Excellence Awards acknowledge and honour outstanding achievement in quality, innovation and service. Following an unbiased, fair judging process, winners for each category at the prestigious Middle East Hospitality Excellence Awards are selected purely on the basis of online votes, received from over 185,000 votes for various categories. This 530-key hotel located within Dubai International Airport (Terminal 1 and 3) greets thousands of tourists and is home to thousands of transit guests. With 71 treatment rooms, the hotel’s Timeless Spa is focused on holistic fitness, offering the finest rejuvenating and relaxing treatments and therapies. Timeless Spa at Dubai International Hotel has won Silver for “Spa of the Year” at the Middle East Hospitality Excellence Awards 2018. Harmoniously combining ancient beauty secrets with wellness therapies, Timeless Spa’s signature treatments and wellness therapies are recognized among the finest spas in the UAE. “Awards and accolades motivate the team to combine efforts and function as one single unit whilst focusing on delivering memorable guest experiences. Gaining recognition at the Middle East Hospitality Excellence Awards 2018 is a testament to our teams’ dedication and service excellence. 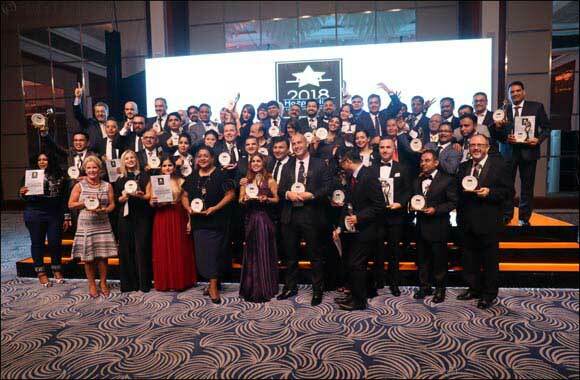 We are both humbled and thrilled to have won these awards and are grateful to all who have voted for us,” quipped an excited General Manager, Avinash Menon.